Hmm, log cabins already existed in C1 game, however these were not build able. They were static starting option. It would be fine include build able garrisoned log cabins as Ftoomsh suggested. I also got them on my whish list, however I called them blockhouses. Such garrisoned fortifications, even few types existed in ACFB game. They garrisoned more men, could be reinforced under fire and strangely stormed through open doors, that was not good. So, few improvements here are well come. Less men in garrison, weaker fire power, only some defence for up to 12 men agianst musket fire. Fire arrows, artillery or sappers with powder kegs are needed to destroy such building. Small sieges or blockade also could be practicable. If blockaded fortification will not reinforced, supplied or relieved by friendly forces after some time it could surrender, at last all garrisons needed some food, water and ammunition. Will be added any new artillery types and new buildings, like log cabins, farms and other? Scotish frame gun is wonderful unit! Tabor ( war wagon) for Ukraine is pretty interesting idea in my opinion. You're right Kamilow but every eastern state need this weapon. For example Poland, Hungary, Ukraine maybe Turkey. Turkey war machine used this gun Battle of Chaldiran against Safavid Persia. By the way what do you think about volley gun? Turkey need this weapon in the game. Cos, Turkey don't use multi barrel gun. But every western nation use this gun. If the developers added this kind of weaponry. It 'd be fantastic. Burak Damgacı is right about war wagons. Above Hungarian ones. I've liked your picture Cherry Lady. Do you any information about if Hungarians used this type of war wagons for made a fortified camp? I have a little information about this subject. I want to translate this webstie and learn more information about war wagons. By the way Hungarian war wagon is pretty good. Maybe I'm wrong but it would seem that every eastern state used this tactic against enemy cavalry attacks or some special purposes. In my opinion. Ukraine used this tactic against Poland, Turkey, maybe Russia. Turkey used this tactic against Safavid Persia, Poland, Hungary , Russia. Hungarian used this tactic against Turkey and other enemies and the list goes on. But most of the important thing is every state learned these kind of tactics during the fighting with deadly enemies. Battlefield is an useful school for developing states. Finally We also have to take a look at minor states histories. For example:Wallachia, Moldavia, Albania... Well, They can use it perfectly and add useful materials to develop this tactic. The Ukraine war wagon looks good: substantial, good bullet protection and room for a dozen men without the cannon piece. The Hungarian one looks more like transport than a fighting platform. I can't see the wicker sides stopping musket balls. This is on a first viewing though. 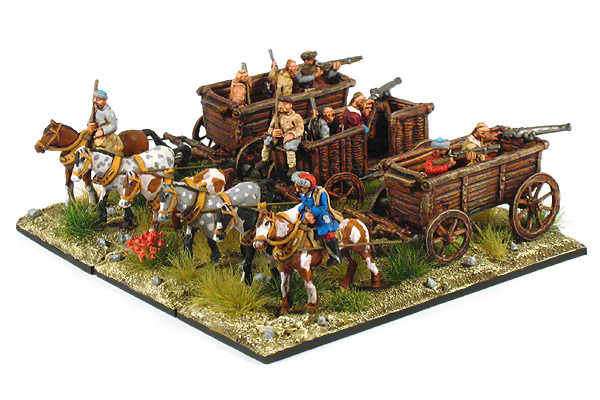 I don't claim to have any historical knowledge about such war wagons, though I know the Cossacks used them. Yep, it's not exactly a war wagon. A text above the wagon: Transylvanian Saxon carrier carrying soldiers. Several times they used the wagons to move the infantry more quickly. Burak Damgacı and Cherry Lady like this. Oh, thanks Npeter. Good information. Your carrier like a useful truck. I wanna ask you another qustion, Hungarian had Ukranian type war wagon or not? Carrier with tranportation okay but what about wagon castle or fortified camp? And What do you think about this type of Austrian tower guys? I have a little information about this tower. Cos I don't understand Deutsch. Tabor is a mobile camp moving with the army. Along with the camp on the Tabors were transported supplies and equipment of the army. The whole was transported on foot or carried by various carts, usually common peasant wagons. 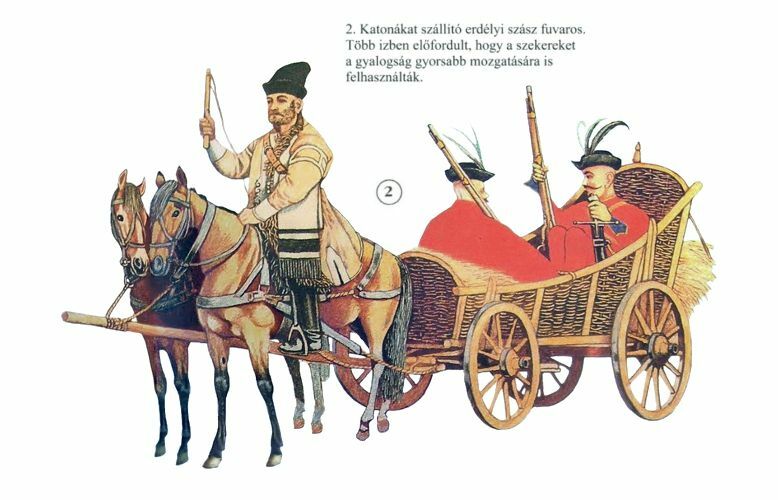 As all XVII century armies also Hungarian armies had Tabors with supplies. For example Sigismund Báthory's army of 40,000 men during his Wallachian campaign had over 3700 wagons served by about 14,000 men. So usually there were 3-4 people per one wagon. Gabor Bethlen army of 20,000 men in 1626 except horse-drawn wagons had also about 2000 wagons drawn by oxen (illustration below). In case of danger carts forming part of Tabor could be deployed around camp, linked together in a temporary fortifications and used for defence, all of this in a relatively short time. Cossacks used this tactic both in defensive and offensive role. @Kamilow You proposed this unit, how do you imagine them in the game? Thank you for useful information. I've a little information about Hungarian armies and I've also known they used these tactics. Do you familiar with this kind of Austrian tower which I send previous email? Hungarian army didn't used expansively wagon forts for defence after the Battle of Mohi (1242). However Hunyadi János (John Hunyadi) took over the tactics of the Hussites Tabor and sometimes used it (defence and attack role). Your another question was about Tschartake. It is a wooden watch tower and mostly built on the austrian border lines. It is a turkish or persian origin tower. English name is Chartaque. And a point of interest: We use Tabor word as 'tábor', and it means 'camp' in hungarian. Thank you Npeter. So useful information. And I have a another question for you. Transilvanian people Hungarian or Wlach? I've confused every time. When I searched Ottoman-Hungarian warfare. Your historical resources always so good and contain useful informations about your units and Ottoman units. Unfortunately I don't understand your language ) I've always believed that Hungary and Turkey two brother country. "Transylvania was based on the alliance of three orders (Hungarian, Székely (or Sekler) and Saxonian), and on the equilibrium of four religions (Catholic, Reformed, Evangelical and Unitarian), led by the protestant Hungarian nobility." But! Many-many wallachian people lived in Transylvania at this time without united social and culture system. And nope, Hungary "truly brother country" is Poland. It doesn't matter we like your country. Thank you for another good information. That's so intresting. How did they equilibrate between the religions? For example: In my opinion: Catholics don't like reformed or other religions. 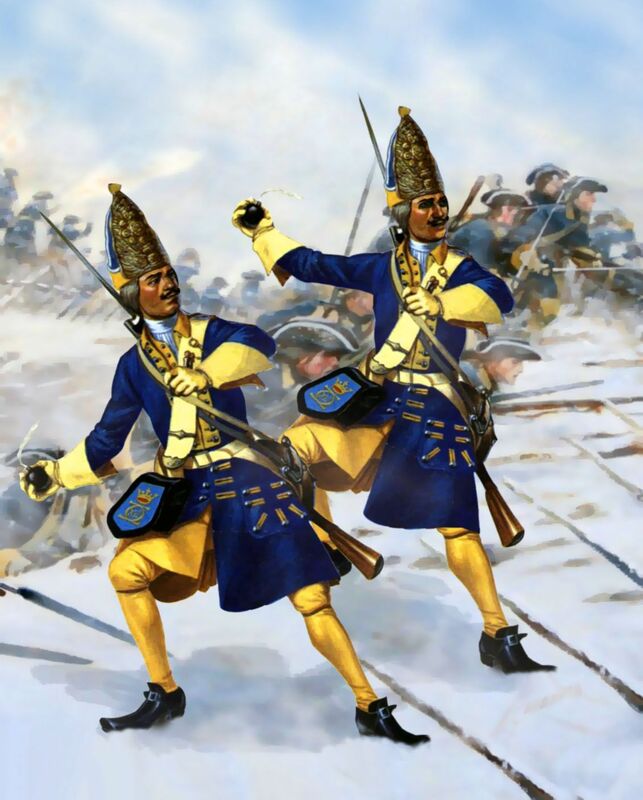 Maybe They could unite against common enemy- Ottoman army- Kuruc period Austrian army. I have a question for your Hungarian forum. Sorry for my curiosity. Thank you for your attention. Hungarian nobility granted the freely religious practice, because they knew religion wars is divide and weaken a state. And some point, yes, it is unite a nation against the enemy (Ottoman and Habsburg). For that was statute like a law in country which gave people rights , proper justice administration and it wasn't like some people talk bullsh** how two regions became one and Poland was in charge. Sweden is 6th. They have tree unique units - more than England or Spain ( Venice don't have even one). Algieria and Turkey should have better units like Nizam-I-Cedid for Turkey , Berber Muskeeters for Algieria and Bedouins for this both factions. Turkey also should have fast cavalry like Balkan light riders.